Just this 2019, a couple of weeks back, Samsung announced its new range of 'M' series budget smartphones. And, just some days back, they launched the Samsung Galaxy M10 and Galaxy M20 smartphones at an affordable price with amazing design. 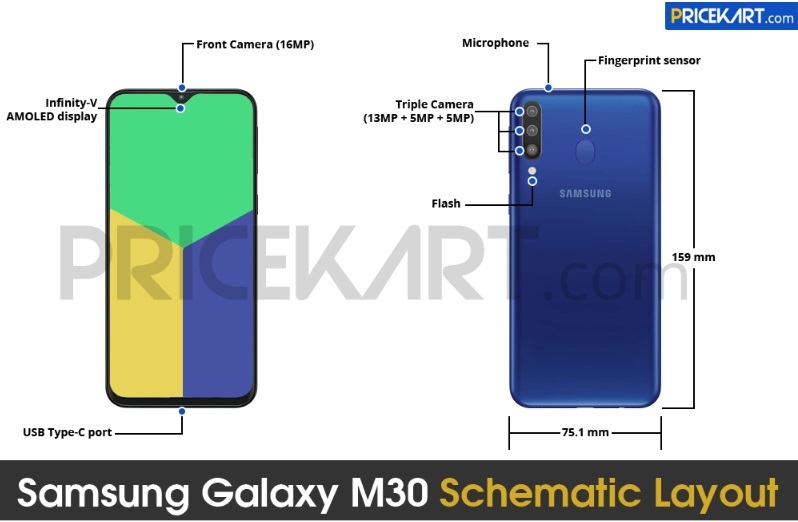 Not too long and now, there is strong speculation that the Galaxy M30 is on the way to been launched. Currently, there is no date yet, regarding when Samsung is actually launching the third smartphone. But, there has been confirmed specifications of the Galaxy M30 smartphone been surfaced online. Just like the Galaxy M10 and M20 smartphones, even this smartphone will sport a gradient finish on the rear panel. Additionally, the smartphone will come in gradient blue and gradient black colour variants. There’s going to be a fingerprint scanner on the back like the M20, but the clearest difference between the M20 and the M30 is the addition of another camera. This triple camera is said to be made up of a 13MP camera, and two other 5MP sensors, with presumably a wide and a telephoto lens each. The picture above is a clear look at how the actual Samsung Galaxy M30 smartphone might look like. The smartphone will come with a 6.38-inch Full HD+ AMOLED display with a screen resolution of 2210 x 1080 pixels. Moreover, the display will feature an infinity-V notch and will be protected by a 2.5D curved tempered glass. Not much different from the Galaxy M20. Again, the Galaxy M30 will also be powered by the Exynos 7904 processor. On the storage end, it will sport 6GB of RAM and will be coupled with 128GB internal storage. It's quite difficult to see a 6GB RAM smartphones on the budget price range, so probably we many expect the device to sport 4GB RAM with 64GB internal storage. 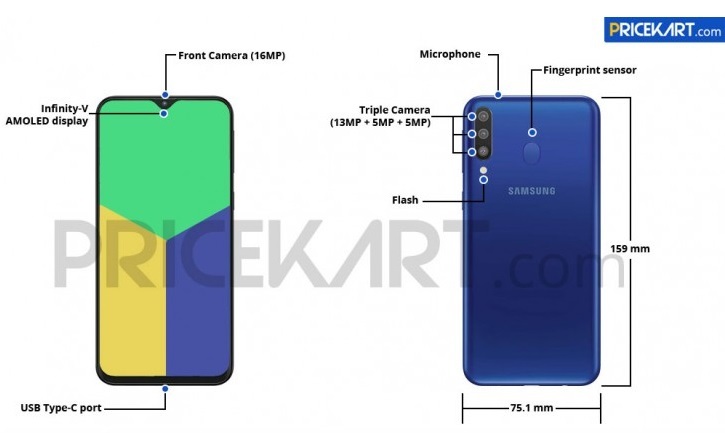 The Galaxy M30 will sport a triple camera setup on the rear panel. This setup will include a primary 13MP with f/1.9 aperture, a 5MP secondary camera and a wide-sensor with f/2.2 aperture and the third 5MP has a depth sensor with f/2.2 aperture. On the other hand, the front camera will feature a single punch-hole 16MP camera. The front camera will be backed with an f/2.0 aperture. And for the power, the device may be powered by a 5000mAh battery. As we all know that big battery mobile phones can last for more than a day on full charge. On the dimension end, it will measure 159 x 75.1 x 8.4mm and weigh 175 grams. Connectivity options on the smartphone will include USB Type-C port, Bluetooth, 4G with VoLTE.